As much as I love reading specific-themed food blogs (dessert, vegan, healthy), I could never write one myself. Why? If you haven’t noticed, I’m all over the place when it comes to my cooking. One week I’m avoiding sugar like it’s the plague and the next I’m making baked goods like Mud Hen Bars or Mississippi Mud Brownies. Cooking my way around the world certainly keeps my options open. 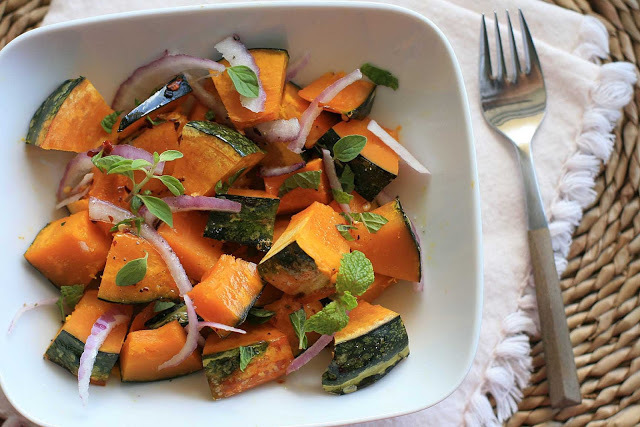 But when I’m not cooking specifically for the blog, my heart belongs to simple, healthy dishes with a little bit of a gourmet touch… just like this roasted kabocha squash with oregano and mint. It’s based on a recipe from what is probably my favorite cookbook find over the past year: Williams-Sonoma’s Cooking for Friends (my Mini Ricotta Doughnuts with Bittersweet Chocolate and Salted Caramel Dipping Sauces is based on a recipe from the cookbook). It’s filled with gorgeous food photos and innovative recipes that are quietly elegant but also very simple. 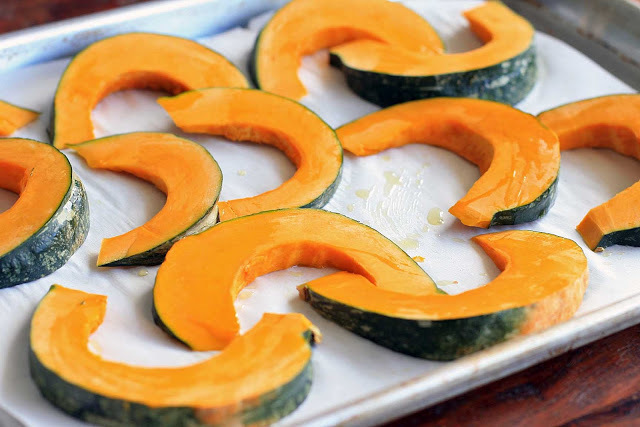 Here kabocha squash, a Japanese winter squash, gets slice and roasted. It’s then cut into chunks, tossed with slivers of red onion and then marinated in a simple red wine vinaigrette seasoned with oregano and mint. 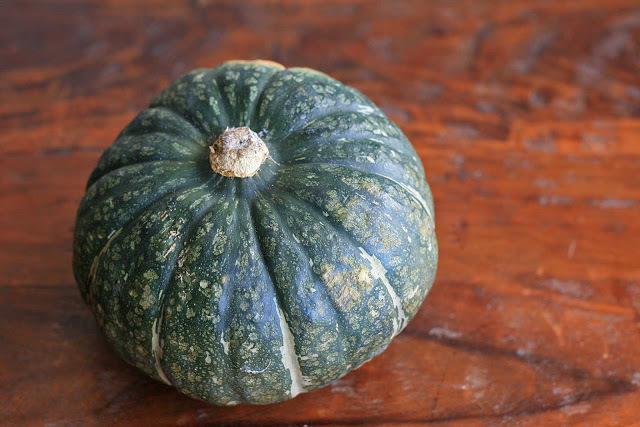 If you’ve never experimented with kabocha before, I definitely encourage you to give it a shot. It’s healthy, easy to cook and it gets bonus points for not needing to be peeled, which provides a nice visual contrast of the green rind and orange flesh. But if you can’t find kabocha, feel free to substitute butternut squash, which is what the original recipe called for. Preheat oven to 400 degrees and line two rimmed baking sheets with parchment paper. 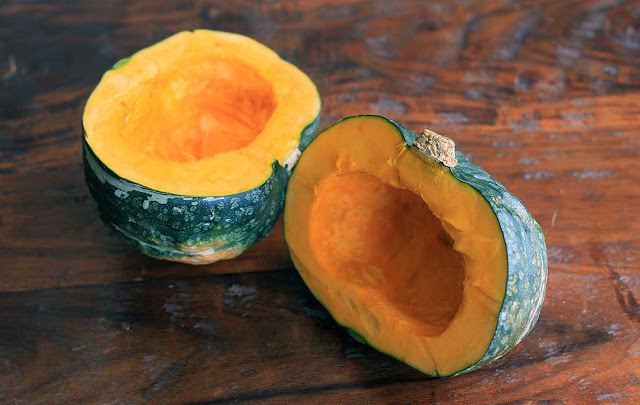 Carefully cut the kabocha in half and remove the stem and seeds. Cut into 3/4-inch slices and place on the prepared baking sheet. Brush with half of the olive oil and sprinkle with salt and pepper. Roast in the oven for 20 minutes, or until soft. Remove from oven and let cool slightly. While the kabocha is cooling, prepare the vinaigrette by whisking together the remaining 1/4 cup of olive oil, vingear, oregano, garlic, red pepper and mint. 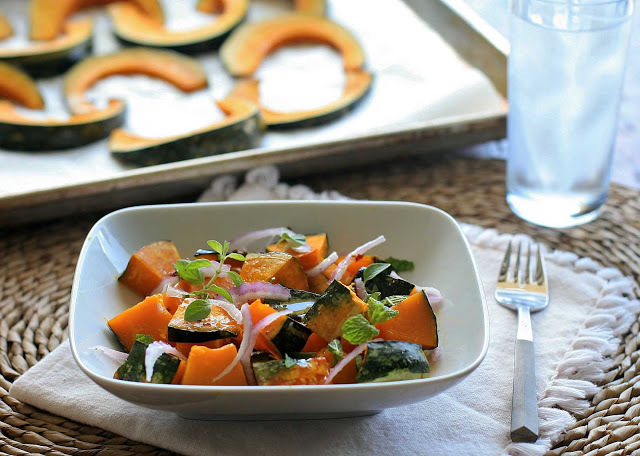 When the squash is cool enough to handle, cut into small chunks and place in a bowl. Top with the red onions and vinaigrette and toss. Let sit for about 20 minutes to give the flavors a chance to meld. Excellent at both room temperature or chilled.